Over 6 years of setting up, launching, and optimizing performance marketing campaigns, ClickDealer has gained intricate insight into the needs and wants of affiliate marketers. At a certain point, it became clear that no individual third party tracking solution possesses all the features required to fulfill those needs entirely. That realization motivated the ClickDealer team to create an in-house tracking platform based on their own experience and feedback from partners. – High-speed live reporting and accelerated redirects for maximal performance. – Custom tracking domain parking available. – Streamlined granular reporting with custom filters. – Upgraded API that lets users benefit from the platform’s capabilities without using the UI. – Flexible build that allows to quickly implement new requested features. Developing fresh in-house solutions to match specific demand is a stepping stone for any company that settles deep enough into its market to find these opportunities. The new platform addresses issues unique to performance marketing, which is ClickDealer’s prime field of expertise. Now it’s up to affiliate marketers to use the new features to their advantage. 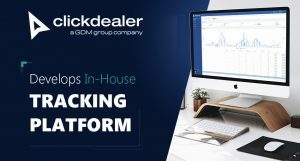 Headquartered in Amsterdam, Netherlands, ClickDealer entered the market with a unique perspective of the global digital marketing landscape that has helped to define the structure and current services of GDM Group. ClickDealer launched in 2012 as a global performance marketing company that specializes in cost per action (CPA) campaigns, delivering high quality and cost-effective marketing solutions for advertisers and publishers.